Penguin Publishing Group, 1958. Hardcover. Good. Disclaimer:A copy that has been read, but remains in clean condition. All pages are intact, and the cover is intact. The spine may show signs of wear. Pages can include limited notes and highlighting, and the copy can include previous owner inscriptions. The dust jacket is missing. At ThriftBooks, our motto is: Read More, Spend Less. Penguin Publishing Group, 1958. Hardcover. Good. Disclaimer:A copy that has been read, but remains in clean condition. All pages are intact, and the cover is intact. The spine may show signs of wear. Pages can include limited notes and highlighting, and the copy can include previous owner inscriptions. At ThriftBooks, our motto is: Read More, Spend Less.Dust jacket quality is not guaranteed. New York: Grosset & Dunlap. Very Good with No dust jacket as issued. 1957. Hardcover. 0448080516 . Text is clean. Cover shows light normal wear, minor bumping to spine ends. Some water spotting to top text edge. ; This printing uses G&D's format #19 (1970-1978) , which is characterized by the "black toy" endpapers, and the Flower Frame Design advertisement on the back cover. This copy lists up through The Tagalong Giraffe. 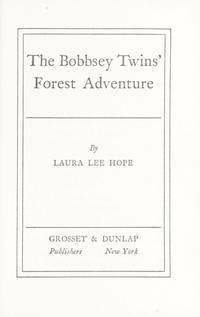 ; Bobbsey Twins Series; Vol. 51; 182 pages . Grosset & Dunlap, 1952. Hard Cover -- Very Good -- Clean and tight with lightest wear -- Pictorial cover with lavender spine and back, no dust jacket if issued -- Illustrated -- Later printing. Hard Cover. Very Good. Grosset & Dunlap, 1957. Hard Cover -- Very Good -- Clean and tight with lightest wear -- Pictorial cover with lavender spine and back, no dust jacket if issued -- Illustrated. Hard Cover. Very Good. New York NY: Grosset & Dunlap. 1957. Hardcover. 0448080516 . Very Good with no dust jacket; Edgewear; Bobbsey Twins; Vol. 51; 182 pages . Grosset & Dunlap, 1958-01-01. Paperback. Good. 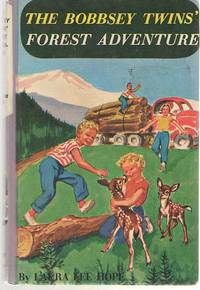 United States: Grosset & Dunlap Book. Near Fine. Illustrated Boards. 12mo - over 6¾" - 7¾" tall. Small biro mark to opening leaf otherwise as new. Bears a 1957 date but this is a 1970s printing. United States: Grosset & Dunlap Book. Very Good. Illustrated Boards. 12mo - over 6¾" - 7¾" tall. Small biro mark to opening leaf, rub to spine, bus time in biro to back endpapers otherwise as new. Bears a 1961 date but this is a late 1960s or possibly early 1970s printing. Grosset & Dunlap. Used - Acceptable. Acceptable condition. Poor dust jacket. Dampstained.Volume 51.